Four years ago Kirk Deighton Rangers JFC established a girls football section for the first time. Now the club have over 50 girls across four age groups enjoying the beautiful game. 2017-18 is only the third season KDR girls have been playing league football and the vision of the club to develop the girls game has now been rewarded with its first championship. 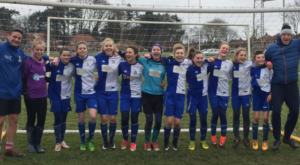 The Girls U13s today won 5-0 away at York RI to take an unassailable lead in the City of York Girls Football League U13 South Division and make KDR JFC history by becoming the clubs first female league champions. With only one league game remaining the U13s remain unbeaten winning 12 and drawing 1. The girls have scored 56 goals, conceded only 4 and have kept 10 clean sheets in the process. Much more importantly the girls have been having fun, building up a fantastic team spirit and have been improving all season. The team are made up of girls from 8 different schools but they have all come together to work hard as a unit and play some really excellent football. All season they have played the game in the right spirit and produced some scintillating attacking football supported by the leagues meanest defence. The girls fully deserve all the accolades due for league champions. There is still lots of football to play this season but for now the girls can enjoy their league success.